Hi Girls, a quick post just to announce the winners of the pattern giveaway I announced a few weeks back. I know I am late, very late, but things have been a little topsy-turvy on the health front with very little that I could do about it. I am sure you don't want any of the boring details so on to the announcement. So, lucky girls, please write to me at crochetkari@gmail.com so that I know which email id you want me to send the pattern PDF. Both the lovely girls above have pretty blogs and they show off some really wonderful crochet creations, so do visit them. I found this on Facebook, if you are aware of the source please let me know. 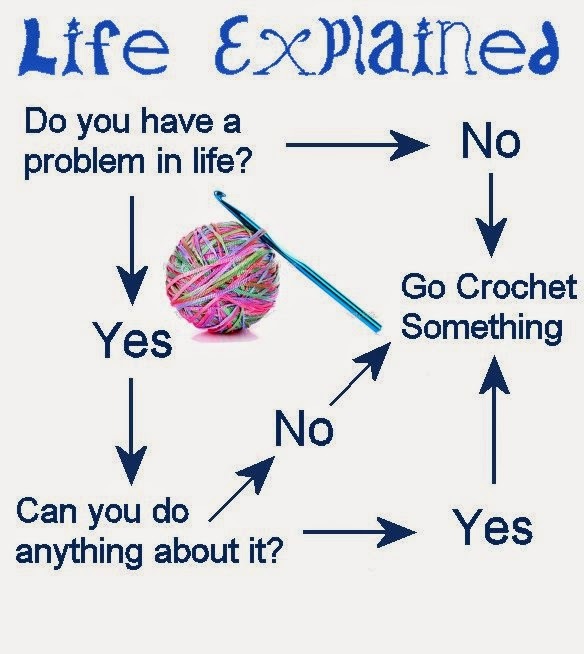 This is my surefire way to solve all problems in my life especially health issues as crochet works like meditation for me. Hehe... it also works as an excuse to avoid any other form of exercise...LOL. Now you can't crochet on the treadmill...can you?! Until my next post, which might be a while, as I am off to Mumbai for a short trip....see ya. Make time for craft everyday. Thank you !!!!!!! It's the first time I win something !!! Liked the idea of solving problems through crochet. Sangeetha, hope you are feeling better. Congratulations for the winners ! !